All fights were scheduled for four rounds. In the main event between light heavyweights, Michael Sanchez (2-1-0, 2 KO) 176.2 of Midland, TX won by TKO over Kelly Westby (0-2-0) 178.2 lbs., of Hobbs. At the opening bell both boxers came out throwing jabs and overhand rights to the head. Neither boxer tried to look for openings they just wanted to get it on. By the second round Westby appeared to be tiring from the crazy pace of the fight. Sanchez was clearly in control and started sitting down on his punches. In the third round Sanchez connected with a powerful uppercut to the head of the exhausted Westby. Referee Ray Chavez stopped the contest at 1:51 seconds of the round to save Westby from further punishment. Sanchez showed improvement each round and could develop if he is brought along slowly. Westby was game, but needs to pace himself better. He scored with some good punches in the opening round, but was careless on defense. 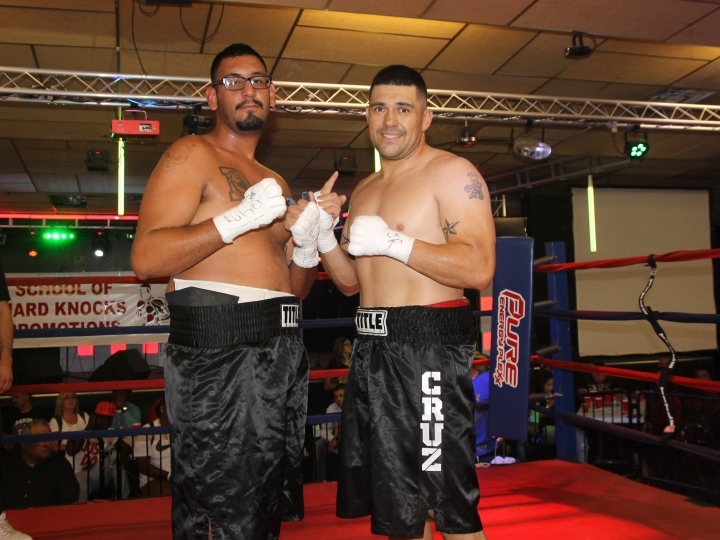 In a cruiserweight contest being billed as the co-feature, Chris Cruz (2-0-1, 2 KO) 208.2 lbs., of Lubbock, TX won by TKO over Eduardo Silva (1-2-0, 1 KO) 217.4 lbs., of Belen. At the opening bell Silva was dropped by a right hand to the head. Rarely does someone get hit with the first punch of the fight, unfortunately for Silva it does happen. Seizing the golden opportunity, Cruz unloaded a landslide of leather dropping Silva to the bottom rope once again. 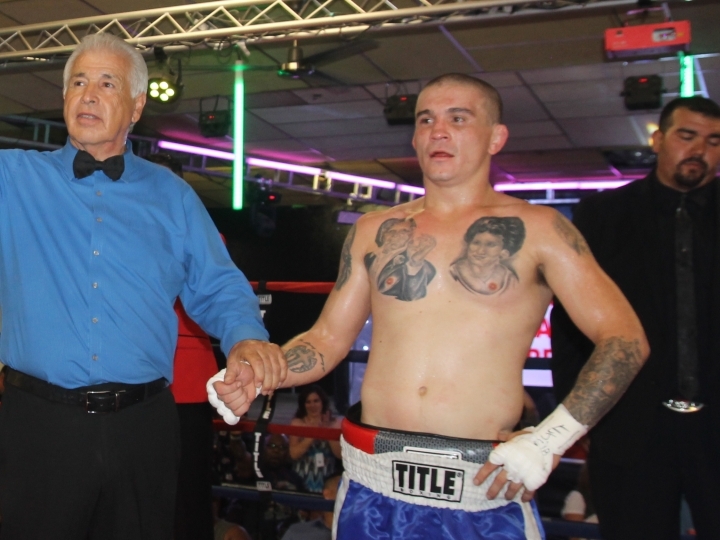 Referee Stan Saavedra had seen enough and stopped the bout at 55 seconds of the opening round. I’ve seen Silva in action before; he’s a better fighter than Saturday night would indicate. 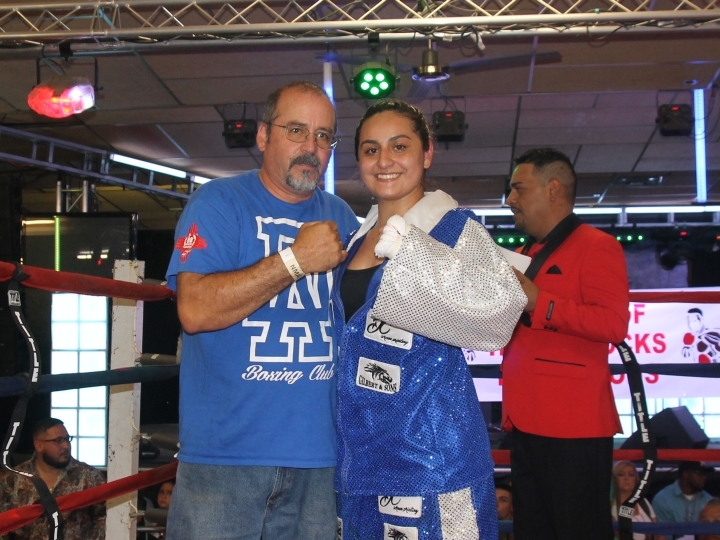 In the fourth bout of the evening, a lightweight contest between females, undefeated Ayanna Vasquez (4-0-1, 1 KO) 136.2 lbs., of Las Cruces won by UD over Bridgette Baca (0-2-0) 132 lbs., of Albuquerque. This turned out to be a much better fight then I expected. I’ve seen Vasquez in action before and she’s a solid pro who is trained by her father Rick. She is very skilled at judging distance, which allows her to stay out of trouble while scoring with accurate punches. Solid defense and sharp counter punching allowed her to control the first round. In the second round Baca started landing some head shots but was taking too many punches in return. This allowed Vasquez to land some big right hands to the head. In the third stanza Vasquez started to take some deep breaths the result of her activity but scored with some powerful uppercuts to the head. Baca was able to pin Vasquez on the ropes and land some shots of her own. Clearly Baca was improving with each round. I gave the final round to Baca, but the three judges didn’t agree with me as Vasquez continued to score to the head. Judges Sandy Pino and Anthony Romero both had it 40-36 while Mark Sanchez scored the contest 39-36 all in favor of Vasquez. After the bout Vasquez stated she would drop down to 126 pounds in the future. Don’t be sleeping on the potential of Baca, she’s in great shape and made corrections each round. This was a good fight. The third bout of the evening, lightweight Aaron Perez (4-0-0, 4 KO’s) 129 lbs., of Albuquerque won by TKO over Gene Perez (2-14-1) 135.4 lbs., of Belen. This was an eagerly anticipated contest and it delivered. Perez was a highly decorated amateur who had been brought along slowly. Gene Perez made sure that wasn’t the case in this contest. Aaron Perez did a nice job mixing his attack to the head and body, scoring with some heavy hands. Combine this with some tight defense and the “Duke City” fighter was looking sharp. Gene Perez didn’t let this discourage him and he landed some nice head shots of his own. The Belen fighter made the mistake of spending too much time fighting off the ropes, which made him a stationary target. In his three previous fights Aaron Perez’s opponents folded under his vicious attack, but not the fighter from Belen. Gene Perez took the body and head shots without showing much effect. As a result Aaron had to dig deeper in search of a stoppage. 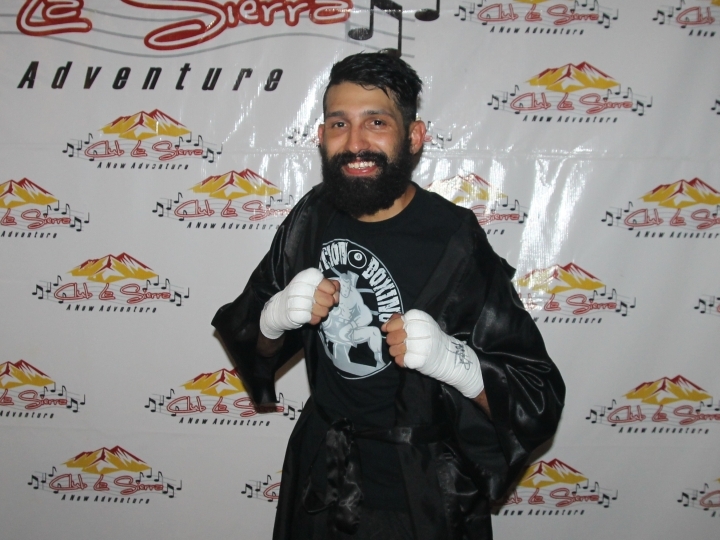 He got it in the final round behind a barrage of blows, prompting referee Ray Chavez to halt the contest at 1:40 of round four. This was a big test for Aaron Perez as he learned that all his opponents won’t fold after one combination. 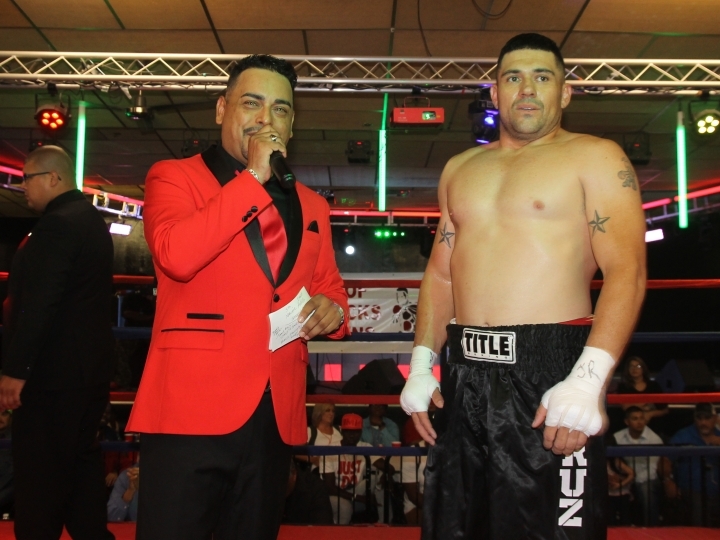 Gene Perez felt he could have finished the fight, with many in the crowd in agreement. 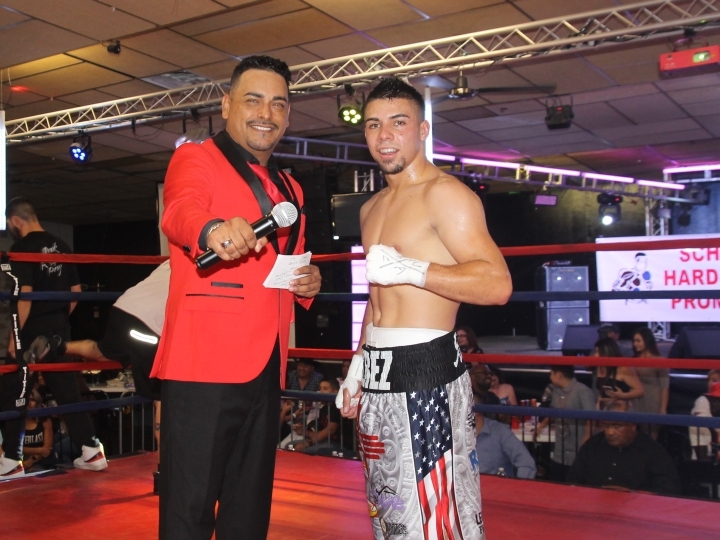 In the second bout of the evening, Jose Prado (10-2-1, 4 KO’s) 146.6 lbs., of Pharr, TX won by TKO over Derek Perez (1-9-1, 1 KO) 146.6 lbs., of Belen. The first round was action packed, with both fighters looking to exchange combinations. The difference was Prado keep switching from head to body and back again, while Perez threw mostly to the head. There were few clinches and the fans loved it. The second round was all Prado. He started throwing combinations with deadly accuracy, while switching his point of attack. Perez was too brave for his own good, causing Referee Chavez to stop the proceedings at 2:42 of the second round. I was amazed at the improvement of Prado over his last fight; he credited the gain of seven pounds as being the main reason. The opening contest was between winless lightweights. 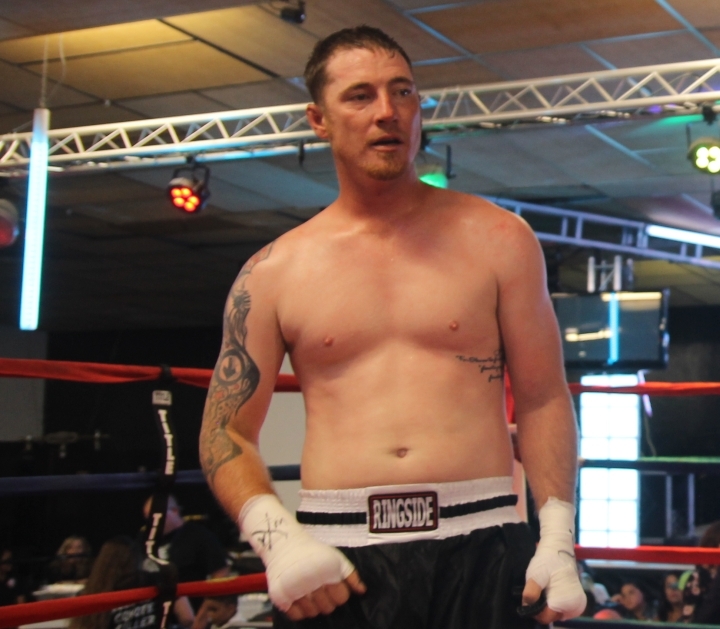 Jorrel Sparenburg (1-3-0, 1 KO) 134.6 lbs., of Hobbs won by TKO over Levi Lucero (0-2-0)137 lbs., of Albuquerque. This is a trademark of promoter Castillo, take two boxers who are in search of their first win and match them up. Sparenburg scored with combinations while Lucero landed some nice overhand rights. Defense seemed to be optional, which proved to be the downfall of Lucero. 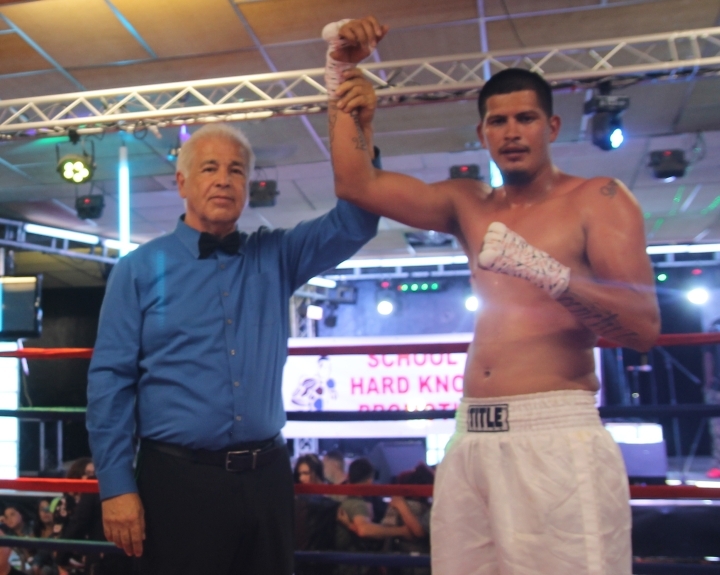 Referee Saavedra stopped the contest at 1:44 of the opening round. I got a chance to speak with Sparenburg during intermission and he said; “It’s nice to get my first win.” After the show I met Lucero’s wife and cute little daughter; he has a nice family. I enjoy meeting the boxers outside the ring; because you get to see their human side. 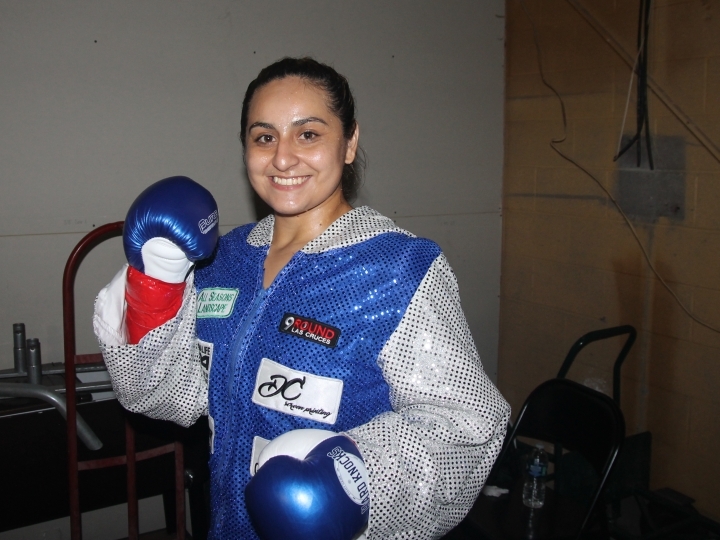 VOICES FROM THE CORNER: Los Angeles bantamweight Jen Hoon Kim remained undefeated with a third round KO over Agapito Ontiveros at the Revolution Bar in Tijuana, Mexico on July 5th. 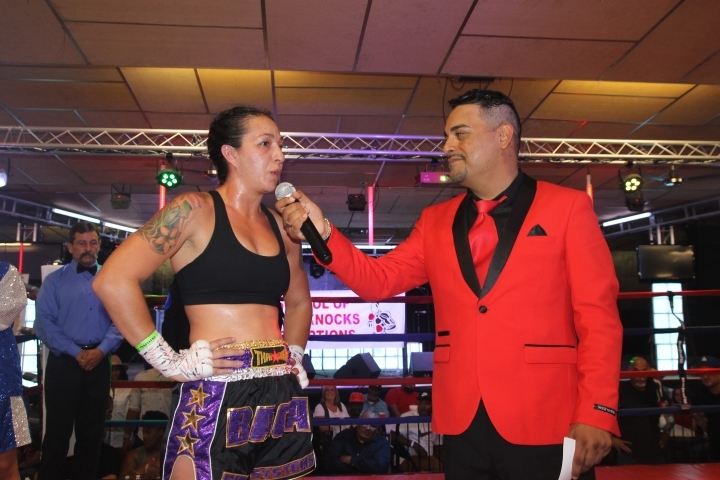 Ontiveros had a height and reach advantage, but it proved to be no obstacle for the hard hitting Kim. He timed his jabs beautifully and landed overhand rights repeatedly. The hard punching Kim is now (4-0-0, 4 KO’s) and is looking to perform in his home town of LA. 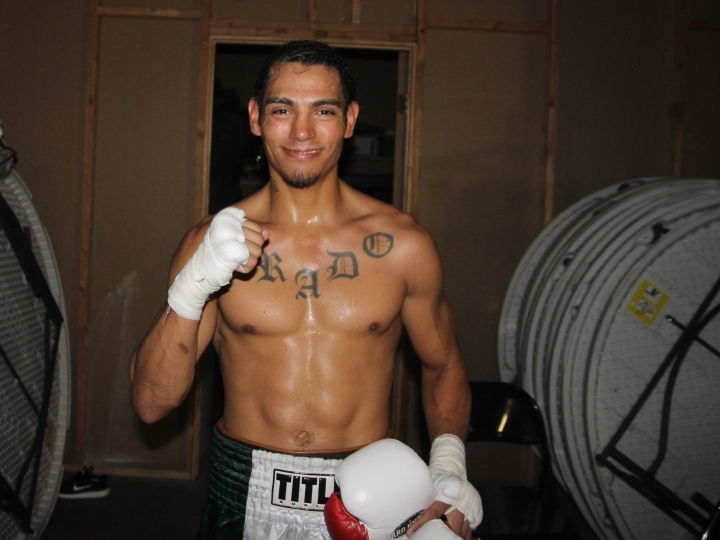 He turned pro on January 27th of this year at the Buffalo Thunder Casino with a 2nd round TKO over Joseph Veloz. Veloz was on the canvas for well over a minute, compliments of a liver shot by Kim. Hopefully the TKO can be changed to a KO.